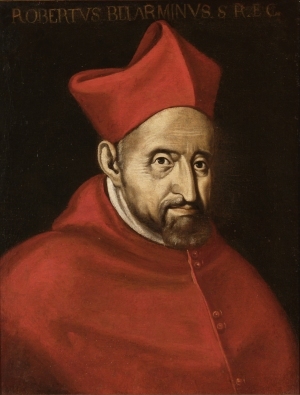 St. Robert Bellarmine (1542-1621) of whom Pope Clement VIII said: “The Church of God had not his equal in learning,” was born of a noble family at Montepulciano in Tuscany, Italy. He lived a very full life conspicuous for exemplary piety. Brilliant and unusually devout, as a young man he attended the Jesuit College in the town. Later he entered the novitiate of the Society of Jesus at Rome, but his course here was shortened partly because of delicate health, which continued throughout his life. Having passed through the course of philosophy at the Roman College, he was sent to Florence, then to Monreale, later to Padua to teach sacred theology, and afterwards to Louvain University. Before his ordination, while still a student at Louvain, he was appointed to preach against heretical doctrines. With consummate skill, he used the teaching of St. Thomas Aquinas to offset heresies on grace, free will and papal authority. Probably on account of this rare success, he was recalled to Rome at the wish of Pope Gregory XIII and appointed to a new chair of controversial theology at the Roman College, of which he later became rector. There as spiritual director, he guided the angelic youth Aloysius Gonzaga in the paths of holiness. It was also during his eleven years at this college that he managed to write his Disputations, a work so great that it was difficult to believe it the labor of one man. A Catechism composed by him at this time is said to have gone into more translations than any book except the Bible and the Imitation of Christ. He was elevated to Cardinal by Pope Clement VIII, who publicly declared that he did not have his equal among theologians in the church of God at the time. Some years later the same Pope consecrated him bishop and appointed him Archbishop of Capua, which office he resigned after three years. He continued his life of penance at Rome and devoted himself utterly to the service of the poor. During his last years he became librarian of the Vatican Library and counselor to the Supreme Pontiff. He evidently kept his heart and mind attuned to the Lord’s summons at death. His “Art of Dying” is witness to this fact. Almost 80 years old, he fell into his last illness at St. Andrew’s on the Quirinal hill and in it he showed his usual radiant virtue. Pope Pius XI canonized him in 1930 and made him a Doctor of the Church the following year. A contemporary cardinal declared that Robert was sent by God for the instruction of Catholics, for the guidance of the good, and for the confusion of heretics. St. Francis de Sales regarded him as a fountain of learning. Pope Benedict XIV called him the hammer of heretics, and Pope Benedict XV proclaimed him the model of promoters and defenders of the Catholic religion. Reflection. The writings of the Saints breathe religion, chastity, integrity, humility and charity. We cannot read their books without imbibing some of their spirit of holiness and love of virtue.